Collagen contains amino acids needed to replenish the body’s collagen supply to help minimize lines and wrinkles, improve skin elasticity, build and support bone matrix, fix split and damaged nail beds, thicken and add body to hair, slow down hair loss, repair connective tissues, improve circulation and promote wound healing glycine needed to build lean muscles and to help burn fat while sleeping. Vitamin C – 60 mg.
Other ingredients include Vegetable Magnesium Stearate although the specific amount of this ingredient was not provided in the product source. 3 tables twice daily on an empty stomach. The product source did not provide any price information. This product is sold through a dealer network and the website contains a tool to use to locate a dealer in a particular area. The product comes in a 120 capsule bottle (a 20 day supply). The product source contained no information about product guarantees or return policies. The product is sold through a network of local dealers. Anyone interested in purchasing this product may want to contact a local dealer in their area for more information on this product including product price, guarantees and return policies. 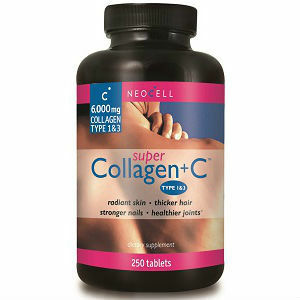 Mark Stevens	reviewed Neocell Collagen C	on November 2nd	 and gave it a rating of 2.